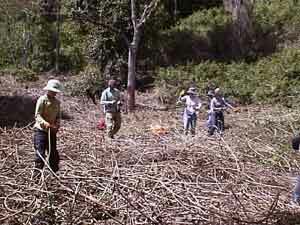 Bush regeneration in our valleys has became more accepted, with more community involvement. Many landholders are now understanding that if more members of the community understand and are involved in bush regeneration in their local area, the extensive bushland interface would stand a chance of being brought to a stable condition. This might also have the effect of reducing degrading impacts such as dumping of rubbish and inappropriate removal and/or planting of the wrong species of plants. To be involved in regeneration you need to have some understanding of what is to be done, some basic training of how to go about it and the use of appropriate tools, sun screen/hat and protective clothing such as gloves, long sleeved shirt and long trousers. The Landcare group can offer support and assistance to landholders. Because much of the land is riparian and undulating to steep, consideration needs to be given to occupational safety issues. There are also hazards associated with the terrain and residual debris as our area has many venomous snakes. While paralysis ticks are seasonal, all year round small grass ticks and scrub mites are present and can cause discomfort to anyone working among the weeds. Leeches and mosquitoes are a normal part of the rainforest eco system and the use of an insect repellent is often beneficial to prevent bites. With the rainfall and climate that we have here in our valleys it is important to only remove weeds from an area which you are able to manage and maintain. Over the years, our group has observed that many people arriving in this area get very excited and clear large tracts, only to find that maintenance is too difficult, and the land returns to weeds. Often the resulting weed infestation is worse than the original, and the landholder becomes disheartened and discouraged. Slow sustainable regen is the way to go. It has been found that lantana is less likely to re-shoot if piled in heaps and allowed to decay as this usually occurs in one season. In our Landcare group we also encourage landholders to leave logs and debris on the ground to provide habitat for native fauna. As weeds will grow very quickly and will prevent new natives from surviving, it is beneficial to leave Wild Tobacco trees for a period until sufficient natural regeneration has occurred. The tobacco trees can provide a canopy and prevent many weeds from becoming established. It is also beneficial to leave some lantana which will provide a habitat for snakes, lizards, small birds and the pademelons. Many fauna rely on the seeds of both wild tobacco and lantana and you can often find small birds nesting in the dense canopy. A benefit of providing habitat for these fauna is that a natural seed source is brought into the lantana and many locally seeded plants will grow amongst the lantana. One mature tree or a dead camphor laurel tree will provide a perching area for many native birds who drop the seeds of other species so that in a short time natives will emerge below the newly opened canopy. Removing weed seedlings assist this natural regen process. It is important to consider the different levels and stages of bush regeneration, i.e where you have the ground covers, the middle level, and upper level of the rainforest canopy. It is vital that you replace the weeds which have been removed with appropriate plants which will provide seeds and shelter for native fauna. The best programs are those where the Landholder has prepared a property plan which is reviewed annually and followed. This allows work to be done where ecological priorities are identified in the overall Project plan for the valleys. The landholder may only wish to work locally but the Landcare group can work on a broader scale. Natural regeneration is preferable to supplementary planting where there is an adequate seed source and weeds are controlled. from seeds brought to the remnants by the process of dispersal. This process is ecologically desirable in that it will maintain the gene pool of each recruited species. In areas where natural regeneration does not occur at a reasonable rate or there is not the desired results of diversity of species you may decide to plant. Planting to supplement natural regeneration may be beneficial if you are expanding the remnant or linking to another remnant. Our group is working on environmental issues as well as ecological issues. Erosion control, weed management and mapping, education and environmental monitoring is now undertaken along with flora and fauna management. Wilsons Creek Huonbrook Landcare Group conducts a nursery where locally sourced seeds are propagated and plants distributed to landholders free of charge. The group encourages landholders to identify suitable seed sources. We are developing a landholder database where species are identified, and where a more detailed assessment of the landscape can be compiled and monitored as we go forward. 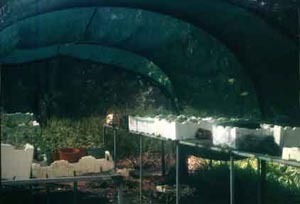 In the Byron Shires Fauna & Flora Survey 1999, locally grown species of plants have been identified and we encourage the planting of locally sourced plants as many are grown in our nursery. It is rewarding to see our efforts in bush regeneration grow into beautiful local native plants.